“Les étourneaux ont tout bouffé !” my mum exclaimed when she told me what had happened to their cherries last year. The cherry trees were so full that they even thought that the branches would give in under the weight. Then, the weather came into the way, preventing them from picking the ripe juicy fruit that was calling for it. And, before they knew it, something happened! Some call it the Law of Nature, I call it Petites Canailles ! (rascals) Clever stealing starlings arrived in masses — they never come alone, do they? — and within a few days, hardly anything was left. How do they even manage to smell these things? Well, sadly — and luckily too for my revenge against the étourneaux — I do not have this problem anymore since I do not have the luxury to admire the life of cherry trees in my garden. Maybe I should get the big garden first, shouldn’t I? And I can hardly express how much I miss this time of year. But good things happen nevertheless. Boston is a place with many fantastic diverse food resources, and a recent trip to my vegetable guy made me forget about it all, even only for a short moment, after I came home with, in my bags, plenty of sweet shiny black and red cherries. They were worth the wait! The season is here! Le temps des cerises ! Most of the time, I prefer to eat cherries simply as they are, fresh or picked from the tree, keeping the noyaux in my mouth for hours before spitting them as far as I can — P. and I even like to compete as to who spits the furthest and the most precise. 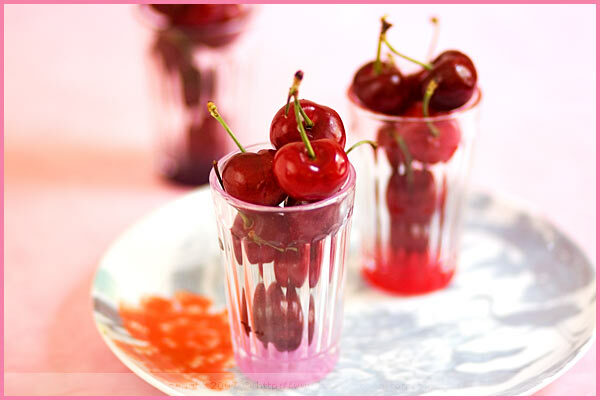 But there are a few preparations with which, I confess, I can sacrifice raw cherries into a cooked preparation. And you know it well, le clafoutis aux cerises, don’t you? 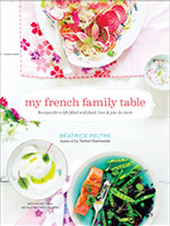 If you are French or have had any connection with French food before, you will have either made one — rather many, non ? — or at least tasted one cherry clafoutis before. And if not yet, why don’t you start now! P. is already addicted and greedy for them, even if he kindly offers me a handful of cherries. I suspect that it is for me to get into the kitchen quickly! Although many fruit can nowadays be used, black cherries remain traditional in a clafoutis. This baked rustic entremets is a French tradition that comes originally from the Limousin area in France. Black cherries are simply cooked in a batter made of eggs, sugar, milk and flour. It can be served lukewarm or cold, and I personally prefer to eat mine lukewarm. In the following recipe, I used cream , vanilla seeds, replaced flour with cornstarch, and added crushed biscuits roses de Reims on top with unsalted chopped pistachios, to add a crunchy nutty touch. But really, clafoutis is as you like, whenever you like! It is a good thing to come back to our classics. Comfy food which brings back numerous tender old memories. What can I say? Cherries are nostalgic to me! At least les étourneaux will not have got to these ones. I did before them! Beat the eggs and yolk with the sugar. Add the vanilla seeds and mix. Dilute the cornstarch in the cold milk. Add the flour and cornstarch to the previous preparation, with the cream. Mix well until homogeneous. Grease small ramekins (or a larger dish) and sprinkle with sugar. Remove the excess. Divide the cherries between them and pour the cream over. Sprinkle with biscuits roses powder and place in the oven for 40 to 45 min, until golden. Remove. Eat lukewarm or cold. When ready to serve, sprinkle chopped pistachios on top. Battez les oeufs et le jaune avec le sucre. Délayez la maïzena dans le lait froid. Ajoutez la farine et la maïzena à la préparation précédente, avec la crème. Mélangez pour obtenir une pâte homogène. Beurrez de petits ramequins et saupoudrez-les de sucre. Enlevez l’excédent. Répartissez les cerises lavées équeutées dans les moules et versez la crème à clafoutis dessus. Saupoudrez de poudre de biscuits roses. Enfournez au four pendant 40 à 45 min, jusqu’à ce qu’il ait une belle couleur dorée. Dégustez tiède ou froid. Au moment de servir, disposez des pistaches concassées dessus. Well it was easy to guess, it is, I think the most popular cherry dessert out there. I just love it, especially with black cherries, my favorite.Miam miam miam. Waaaahou ça me plait énormément tout ça! Wonderful! I love the inclusion of pistachios and rose biscuits and the stalks jutting out of the cake triumphantly. 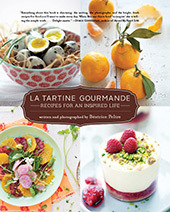 Lovely, definitely adding this recipe to my collection and it had never occured to me to make individual clafoutis, how adorable for a champagne breakfast or supper party, picnics or lunchboxes too. Thank you! ça me plaît quand tu revisites les classiques! I like the combo cherries-pistachios, very nice : ). 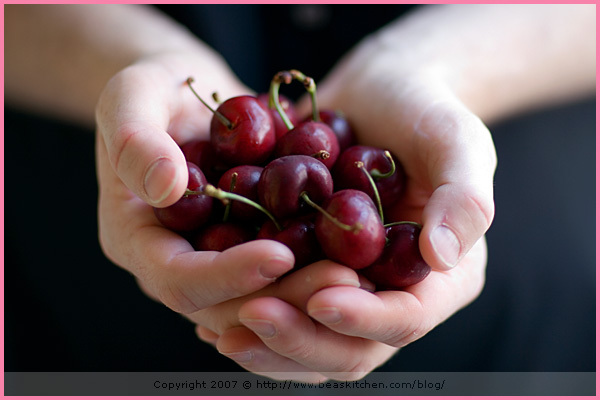 and what about sour cherries…don’t you love them too?!??! I know without trying cherries and pistachios would taste wonderful but I’m always in awe of the artistry of your presentation. Il est bien court le temps des crises, alors profitons-en ! 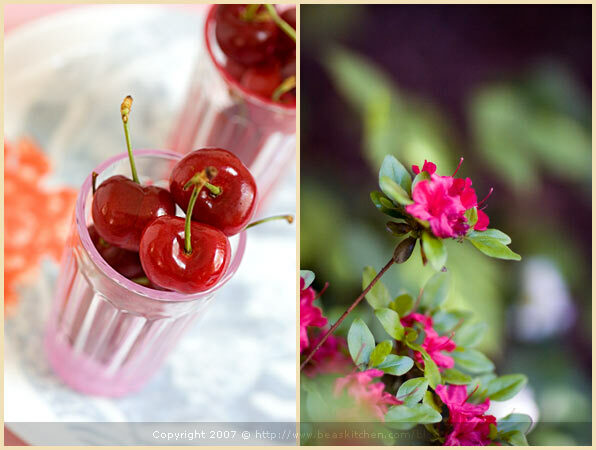 Call me cheesy, but your recent two cherry posts just reminded me of a choir song “Cherry Ripes” (when I was in primary school and that was the song my choir selected for the state choir competition!). LOL! le clafouti au cérises est l’un de mes desserts préférés. Difficile de résister à ta recette!! Je n’avais jamais pensé à l’ associer à de la poudre de Reims, il me tarde d’essayer! Des pistaches ou des noix concassées sur le dessus des mousses, clafoutis et compagnie, c’est ce qui me rend complètement folle de ce type de desserts. Ta passion pour les cerises ta va à ravir! Amazing how both our brains function…! It’s like virtual sisterhood! 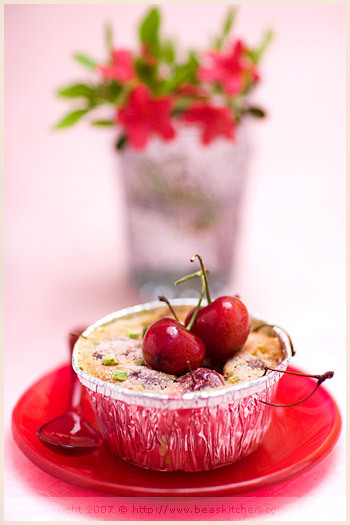 Cherries are nostalgic to me too, and clafoutis well, it’s clafoutis…always comforting! 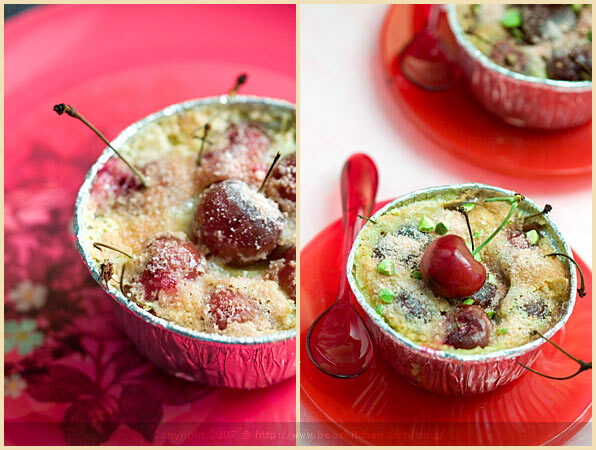 I love the presentation with the cherries still having the stems on in the baked clafoutis. I love this dessert whit yellow peaches.Like always your pictures are amazing. I love cherries! And those look so beautiful and I guess really good. I will have to wait a while until I will get them here… it is not warm enough. How beautiful. Where is the cookbook? every shot you takes is as delightful as Spring time! Black cherry, wish I could taste this gem some days! Aujourd’hui, c’est encore une recette simple et délicieuse, pleine de bons fruits, qui me fait saliver d’envie ! J’adore les photos. Et les cerises. Lovely photos, once again! I really enjoy reading & _looking_ at your blog! To avoid birds eating your cherries, hang CDs on the banches, the light reflecting in the CDs will afraid birds. Pas si classique ! avec les pistaches.. I made a clafoutis earlier this week after finding cherries on sale. Hadn’t made one since the year I returned from living in France. They are still wonderful – perhaps when I return home from my vacation next week, I’ll try your version; I’m intrigued by the idea of pistachios. fait, mangé … verdict ? même sans la poudre de biscuit c’était délicieux ! J’aime ces classiques 🙂 merci ! These biscuits are a speciality from France, Reims. You have to look for “biscuits roses de Reims”. They are a specil type of ladygingers from the area. Good luck. I have just made this recipe with bananas, which I had more than a dozen super ripe, and light cream. Aiii! I really hope it will be good. It is in the oven right now!. Heresy! Clafoutis is not made with sweet dark cherries, but with red sour cherries (Montmorency are the best).